If you are a fan of watching high-scoring hockey, then the LaHaye Ice Center was the place to be Friday night, Jan. 25. The Liberty Flames Division I men’s hockey team dominated Rochester College, 13-2 in the first installment of a weekend home series with the Warriors. 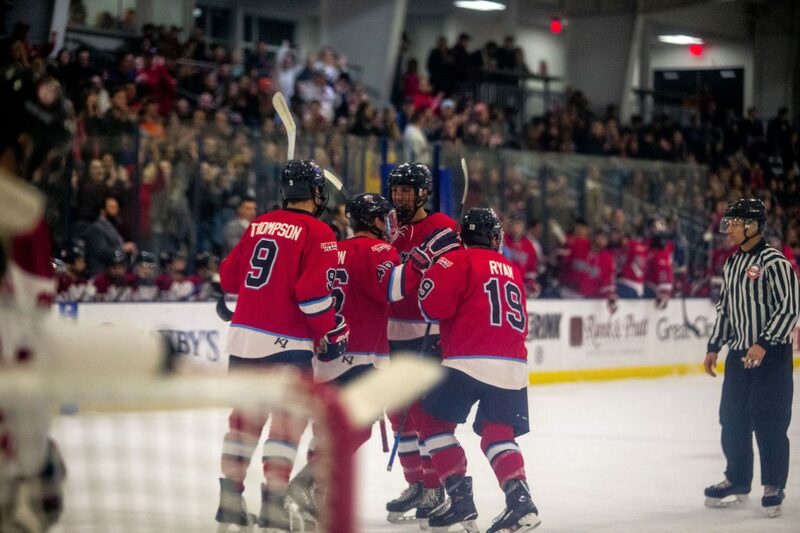 The win ended Liberty’s two game losing streak, which came at the hands of Stony Brook, and gave the Flames their first win of the spring semester. Sophomore forward Cole Gammer, who scored two goals and an assist, was impressed with the team’s response after last weekend’s letdown against Stony Brook. While the final score suggests that Liberty had the game in control from start to finish, they had some difficulties in the early going. After junior defenseman Garret Nelson scored on a power play to give the Flames a 1-0 lead, a slashing penalty by Andy Clark and a hooking penalty by Basil Reynolds gave the Warriors a 5-3 advantage with 14:02 left in the first period. Forward Joseph Tabbi scored shortly thereafter and tied the game at 1-1. That was the closest the Warriors would get to beating the Flames, who despite having to kill six penalties, including a 10-minute major to Clark, were able to score four unanswered goals to end the first period with a 5-1 advantage. Gammer believed the Flames ability to overcome those mistakes was the key in paving the way to victory. COMRADERY — The Flames are 19-6 on the season. Head Coach Kirk Handy was also impressed with the resilience of the Flames penalty kill, which was kept busy throughout the entire night. “Our penalty kill has been solid most of the year, and it was great again tonight,” Handy said. Once the second period started, Liberty continued to impose their will on the Warriors. The Flames started the second on the power play, and successive power play goals by center Quinn Ryan and forward Joe Bochinski gave the Flames a 7-1 advantage. The Flames would finish the night 4-6 on the power play. After allowing this eighth goal of the night with 14:47 left in the second, the Warriors benched junior goalie Robert Meadows, who made 15 saves on 23 shots. Unfortunately for Rochester, backup goalie Trevor Osko surrendered five goals to make the final deficit 13-2 in Liberty’s favor. The Flames hope they will be able to continue to play the right way on Saturday, when they rematch with Rochester at the LaHaye Ice Center. The puck drops at 7 p.m.